Taking a break with the whole family can be challenging, as the chosen destination must have something to keep everyone happy and entertained. Fuengirola on the Costa del Sol has all that and then some. Whether it’s lounging on the golden sands, browsing the shops or visiting the many attractions along the coast, everyone in the family is guaranteed a good time. Having moved into your ideal child friendly accommodation on the Spanish coast and dug out your beach gear, the following are some recommended locations and activities for the whole family. With seven kilometres of clean, well-kept beaches on offer, there's always a spot to park your beach chair or rent a comfortable sunbed with parasol. All along the Paseo de Maritimo - or beach promenade in English - is a selection of beach bars and restaurants with facilities for sunbathers, along with showers on the beach, playgrounds for the children, exercise facilities and - most important in the busy summer months - lifeguards keeping a careful eye on the situation. Lining the beachfront are several shops selling beach gear, buckets and spades, beach balls and clothing, along with cooling drinks and snacks. Various restaurants serving international and Spanish cuisine and catering for the whole family are also available. For the older kids and teenagers, and dotted along in various spots on the beachfront, Costa Water Park is a lot of fun. 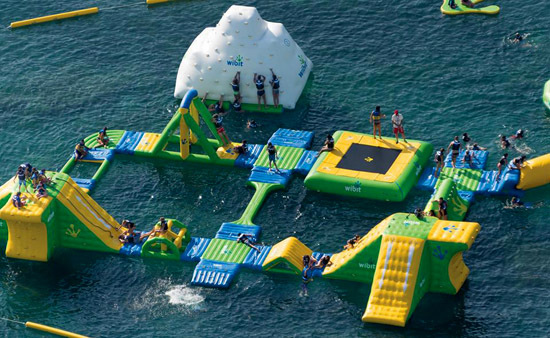 These are the equivalent of jumping castles on dry land, with climbing, bouncing and sliding and other opportunities for fun out on the waves. All the necessary safety gear is available for both adults and children. 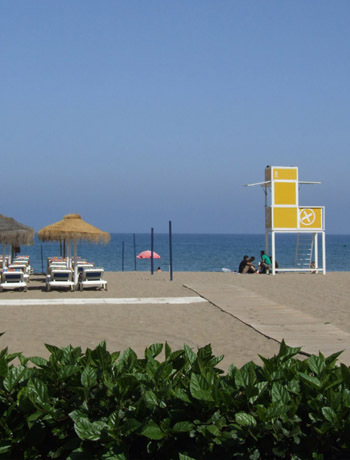 Photo courtesy and copyright Anne Sewell Fuengirola is one of the most popular seaside resorts along the coast and right in the heart of town is a magical place to spend a few hours. Bioparc Fuengirola used to be a normal (and not particularly pleasant) zoo in the past, but in recent years has been redesigned and upgraded into an lush and beautiful oasis. Instead of cages, there are natural and spacious environments for the animals, many of which are members of endangered species. 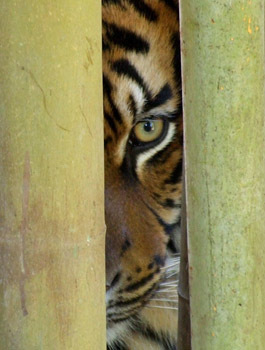 As the Bioparc is actively involved in conservation and preservation of endangered species, the accent has been on breeding those same species successfully in captivity. Chimps, who were previously miserable in their caged environment are now happily fathering families. The buff cheeked gibbons, while maybe a little more shy, have also produced young. There have been baby Borneo orangutans, Colobus monkeys, lemurs and even tiny tigers. All are living proof of the success of the Bioparc’s programme. For humans visiting the Bioparc, the tree-lined and shady paths take you to the various exhibits in the Asian and African sections, with realistic jungle sounds as you stroll. Highly recommended is a visit to the Madagascan lemur enclosure where you can get up close and personal with these remarkable creatures. Throughout the summer months, a variety of educational and fun exhibitions are held at the zoo, including African dancing. Visit just some of the residents at Bioparc Fuengirola in the video below. For those wishing to travel further afield, the Renfe train runs between Fuengirola and Malaga city, stopping along the way in Torremolinos, Benalmadena Costa and other seaside locations along the way. Should you wish to head further down the coast to Marbella, Estepona and other locations a regular bus service is on offer.